As team members at Everything Dinosaur make the final preparations for the new Procon/Collecta, Papo and Carnegie Models to arrive, the fact sheets that our experts have prepared to accompany each new replica are checked and re-checked. Amongst the twenty-five fact sheets that have been compiled, there is one for Amebelodon, a member of the elephant family (Proboscidea – animals with trunks), in preparation for the receipt of the Amebelodon model from Carnegie Safari, part of their Prehistoric Life range. In the course of our research on this particular member of the Gomphotheriidae, our team members became stuck when we tried to interpret the meaning of the genus Amebelodon. The elephant family can be traced back to the Eocene epoch and they have a long and diverse lineage. The unique shovel-like shape of the lower (mandibular) incisors has led to Amebelodonts being called “shovel-tuskers”, but this we knew was not the exact derivation of the Latin (or Greek) name. A quick email to Mark Hallett, a palaeo-artist and writer of a recent and most informative article on the history of North American Mastodons; featured in the magazine Prehistoric Times and our problem was solved. 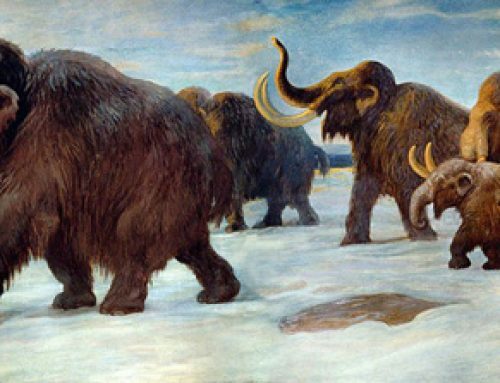 According to Mark, who co-incidently had been emailed by a Prehistoric Times reader on this subject just a few days earlier, the name Amebelodon is derived from the Latin/Greek for “shovel” and “dart” plus “dont” (which means tooth). So we get the descriptive name “shovel-dart tooth”. The name is apt as this ancient elephant had two pairs of tusks, a dart-like pair similar to those of an extant elephant in the upper jaw, and the shovel-like tusks in the lower jaw. Amebelodon was formerly named and described by the eminent American geologist and palaeontologist Erwin Hinckly Barbour following the discovery of lower jaw material in Nebraska. With two pairs of tusks, one like a set of darts, the second shaped like a shovel, the name Amebelodon is particularly appropriate. Our thanks to our friends across the Atlantic for helping us out. Old World and New World co-operation with regards to primitive elephants is particularly appropriate. These animals are believed to have originated in Africa (the Old World) and then over the Neogene Period to have migrated across land bridges to Europe, Asia and the New World of the Americas.